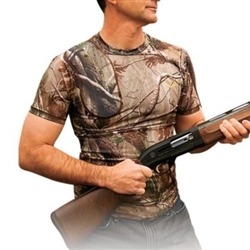 For additional recoil protection for your shoulder, we offer both the SHOOTERSHIELD shooting shirt by Evoshield and the Shoulder EEZ by Kick EEZ. Evoshield's Shootershield is an innovative, custom formed shield and shirt technology to save your shoulder from the effects of recoil. For those who just need some excellent pad material to fit into a shoulder pocket on a shooting shirt or vest, the Shoulder EEZ Sorbathane sheet can be cut to fit anything you want. If you have any questions or need assistance selecting the right product, please give us a call or email us and we'll be glad to help you out.